Swapping school for sweat shop misery | The Dacorum Heritage Trust Ltd. Straw plaiting has been practised in Bedfordshire, Buckinghamshire and Hertfordshire since the early 17th century, and by the 18th century straw hats, worn mainly by country people, became fashionable for everyone. London imported the specially grown straw, such as Italian straw from which Tuscan plait was made, to manufacture most of the elaborate hats for the expensive trade in England. However, hats were also made at Luton, Dunstable and St. Albans and when the French wars stopped the import of foreign plait, the hat makers were dependent on local plaiters. The chalky soil of the Chiltern fields grew the tall, straight, thin straw, which was most suitable for plaiting, but it was members of the Waller family of Luton plait merchants who claimed the credit for the great improvements in the quality of English plait. From the farmer the straw passed through the hands of a number of ‘middle men’, the dealer, drawer, stripper, sorter, bleacher and so on, before it was ready for the plaiter. With the availability of the basic raw material, straw plaiting reached its peak in the 1850’s with many villages in Dacorum being completely dominated by the trade. The census returns for 1851 for Potten End, for example, show the trade ‘plaiter’ against the names of nearly all the women and most of the children over 10, with several younger ones also included. 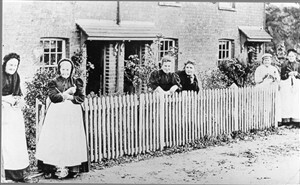 In Berkhamsted straw plaiting supplanted lace making and plaiters were to be found in the majority of households in Hemel Hempstead. Only Tring, where a silk mill had been established in 1824, were there more opportunities for employment than in straw plaiting. Splint Mill used by plaiters to flatten straw prior to making plait for hats. Manufacturers mark, J. Spratley of Luton. Arthur Young reported in 1804 that straw plaiting was “highly beneficial for the poor”. Indeed, women and children worked long hours in this cottage industry to supplement the meagre family income. A good plaiter at the beginning of the 19th century could earn £1 a week, more than double the agricultural wage of 6s. – 8s. 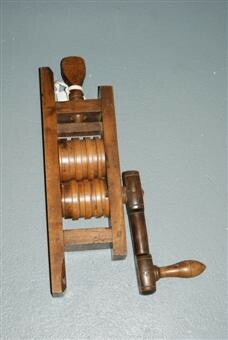 Even when the price of plait fell in the middle of the 19th century, a woman aided by her children could add 12s. a week to the family income. The industry was one easily carried out in the home, requiring only three simple and inexpensive tools, a straw splitter, a splint mill and a yard measure. By 1800 various machines, or ‘sheens’, had been invented for splitting each straw into splits of varying widths. 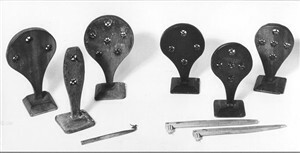 Before plaiting, the split straws had to be pressed flat in the splint mill, a small wooden mangle with boxwood rollers, screwed to a door-post. After the plait was made it was measured into lengths of scores (20 yards or 18.3 metres), the unit for sale in the market. 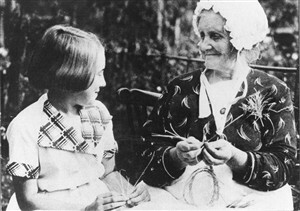 Three main forms of plait were produced – plain, pearl and brilliant – with several variations being produced from them, some by using coloured straw. Although Berkhamsted had a weekly market, the plaiters from outlying districts such as Fristhsden and Potten End preferred to walk to Hemel Hempstead where the plait market, situated behind the King’s Arms, was a great feature of the town. Boys, as well as girls, were tow or three years old when they began to clip the finished plait, but by the age of four they attended one of the numerous plaiting schools. These schools, found in every town and village in the area, resembled sweat shops rather than places of learning. The misery of the long hours and the rushing discipline of the plait schools is revealed by the Children’s Employment Commission Report of 1864. Mrs Wimbush, who had a plait school in Northchurch, stated in her evidence that 41 children plaited in a room 10 feet square, and at busy times the same room held 60 children. She also admitted to caning the children. The parents paid 1d. – 3d. a week and supplied the straw. It was rare for any other subject to be taught, as the main function of the mistress was to ensure that the children completed their work. The 1867 Factory Act, banning the employment of children under the age of nine, should have closed the plait schools, but a loophole in the Act allowed them to carry on until 1871. Even after the Education Acts of 1870 and 1880, which made education compulsory, parents kept their children away from the board and village schools in order to plait. Therefore, this area was educationally one of the most backward in the country. The 19th century was not only a century of industrialisation; it was also a century of free trade. This allowed cheap plait to be imported from Italy and later China and Japan. By the 1870’s an experienced plaiters earnings had dropped to about 4s. a week and this led to the decline in the straw plaiting industry. Free trade, therefore, was one of the two reasons for the closure of the plait schools, the other was that in 1891 education was not only compulsory, it was also free. In spite of all the hardships, straw plaiting provided a much-needed income for the labouring poor. The craft, the way of life of the plaiters, together with their independent spirit, has endured in local memory. Indeed, in many places in Dacorum, descendants of the plaiters remember those days with pride. Published in The Dacorum Heritage Trust Ltd. Newsletter No. 21, December 2000.